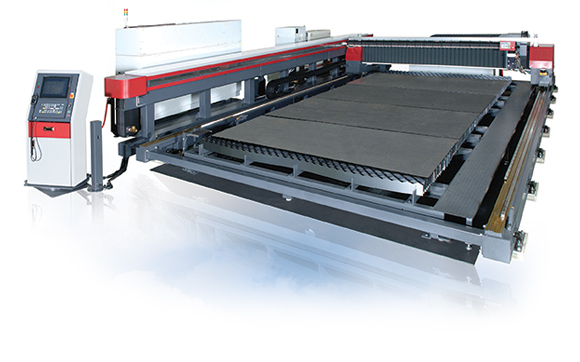 The Mitsubishi XL with Its flying optic design provides diverse applications at high speeds and its large work area allows for precision cutting. The 6030XL is the comprehensive solution for any shop's needs. High speed, heavy-duty motion system. Reduces processing time as much as 50%. Diamond Path advanced beam delivery system. Superior edge quality and processing consistency over entire work area. PC-based, 64-bit NC control has touch-screen user interface and full network capability. Easy access to processing area. Makes setup and changes faster and easier. Ultra rigid, single platform Dianite cast machine frame. Provides the ultimate stability that ensures high-speed processing accuracy. High speed, heavy-duty motion system. Reduces processing time as much as 50 precent. Ultra rigid, single platform DIanite cast machine frame. Provides the ultimate stability that ensures high-speed processing accuracy. Generator Operation Control Beam ON/OFF, laser gas change, etc.